For those readers who have been following Digital Gods since the beginning, the DIY auteur Zachary Oberzan isn’t a new discovery. I covered his work at length in one of my first articles for this column, choosing him for the simple reason that his work embodies everything that this column stands for. He’s independent in ways that would shame Steven Soderbergh and his movies are so singular that the idea even imitating them seems impossible. This singularity comes at a price, though. Oberzan’s movies (with the possible exception of his widely publicized first feature, Flooding with Love for The Kid) remain regrettably underseen. 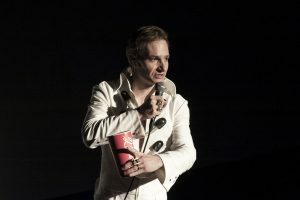 Unlike many lesser filmmakers, he struggles to even have his work featured in film festivals, relegating it to the no man’s land online self-distribution and whatever random public screenings he can manage to occasionally scrape together. This is a shame because audiences should be subjected (by force if necessary and as often as possible) to the extraordinary pleasures of an Oberzan picture. I say all this as a justification for once again returning to the Oberzan well. My previous article served as an overview of his career, but there’s since been a new development. Recently, Oberzan finished and released his newest feature, The Great Pretender. I had seen an unfinished cut of this work when I wrote the previous article, but, now that I’ve seen the finished movie, I feel that it deserves its own special attention. A special mention should be made of the creative support that Antwerp’s deSingel art center provided The Great Pretender. All of Oberzan’s features blend theater and cinema in ways that often require the space and sponsorship of an organization like deSingel. Without their involvement it is unlikely this movie would have been made. It’s a good reminder that even the most independent artists often need a community to support and help realize their visions. The Great Pretender is a remake of Abbas Kiarostami’s Close-up. In it, Oberzan plays a man named Aaron Aaronovich who is on trial for fraud. His crime was duping a Belgian theater company into believing that he was Zachary Oberzan, the great American star of film and stage. So Oberzan plays a man pretending to be Oberzan. The next level of confusion is that the movie is shot in a pseudo-documentary style (ala Close-up) by a filmmaker who introduces himself as Abbas Kiarostami. 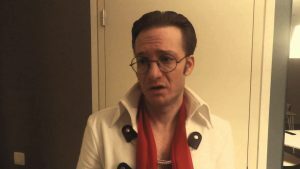 So we have the real Oberzan playing a fake Oberzan in a fake documentary directed by a fake-but-pretending-to-be-real Kiarostami…and the whole thing is periodically interrupted by an on-stage, extra-cinematic Oberzan in an Elvis costume, performing songs and commenting on the action of the movie. What I find so moving about The Great Pretender is the way it uses plagiarism to explore deeply felt observations on failure and self-loathing. Oberzan has built his entire oeuvre on imitating his heroes, whether they’re John Rambo, Jean Claude Van Damme, Leonard Cohen, or Abbas Kiarostami. Here more than ever, he uses his heroes to reflect on his own position in the cosmology of creative genius. By casting himself as a man wishing he was Zachary Oberzan, he is able to externalize his own perceived career shortcomings. Why would someone pretend to be Zachary Oberzan? Obviously, because Zachary Oberzan is such a massive success whose films have touched the lives of millions! What budding artist wouldn’t want to be Zachary Oberzan? The reality, though unstated in the movie, is obviously much more bleak. Oberzan is a struggling artist of limited means who had to leave his home country in order to scrape together a sustainable creative career. In all likeliness, he has never met someone who would want to have his life. The Great Pretender is his way of openly reflecting on the self-defeating fantasies that probably exist in some form in the minds of all creatives. This is why, when Oberzan-the-actor meets Oberzan-the-character, he breaks down in tears and embraces his fictional self. All the artist wants is to be for someone else what he is for himself in his own fantasies. People have always been obsessed with reproducing images of their perceived betters. It’s the basis of pious religious practices as well as hokey Vegas sideshows. All of Oberzan’s films fall somewhere between these two extremes. He’s simultaneously the medieval icon painter and the fourth grader scribbling pictures of Transformers in his notebook. Like both, his motivations are mysterious and perhaps unknowable. The Great Pretender is a spectacle propelled by irrational compulsion that dares to be absolutely ridiculous without once laughing at itself. It is Oberzan’s most assured articulation of his career-spanning obsessions with fame, critical self-reflection, and popular culture. If contemporary viewers aren’t ready to deal with this vision, we can only hope future generations use it as a sort of Rosetta Stone to understand and unravel the mysteries, contradictions, and unrelenting spectacle of 21st Century life. The Great Pretender, like all of Oberzan’s features, is available for rent or purchase through his Vimeo channel.